Combat Mission is a series of games released by Battlefront.com depicting tactical combat at the company level. Three games using the original game engine (CM:X1) were set in the Second World War, two of which included Canadian forces. A second game engine (CM:X2) debuted in 2007, with titles also including other eras including near-future and the 1980s. Charles Moylan was an experienced programmer, having worked on several of Avalon Hill's computer projects. In 1997 he was unofficially working on a computer adaptation of the famous Advanced Squad Leader board game. Moylan came to realize, however, that the game would be difficult or impossible to adapt successfully to a computerized version. Atomic Games had also attempted to produce a "Computer Squad Leader" game, but abandoned the tie-in to ASL and eventually marketed the game successfully as Close Combat. Early in 1998, Avalon Hill's instability prompted Moylan to go his own way, creating Big Time Software shortly before Avalon Hill's purchase by Hasbro and the severing of ties between AH and ASL. The unfinished computer project had no references to either AH or ASL, and Moylan briefly shopped the early Alpha build (tentatively called Squad Leader) to different publishers. Not satisfied with the contacts he made, he teamed up with Steve Grammont, forming what eventually became Battlefront.com and re-christened the new game Combat Mission. Big Time Software produced the first game of the Combat Mission (CM) series, Combat Mission: Beyond Overlord, in 2000. Big Time Software eventually became known as Battlefront.com, with additional members being hired to the team including Martin "Moon" van Balkom, Dan "Kwazydog" Olding, and Fernando Julio Carrera Buil and Matt "Madmatt" Faller, who handle the company website, graphics and sound design, and organizing beta testing of new products. Combat Mission expanded to two series of computer games simulating tactical battles. CMX1 refers to games created for the original game engine set in the Second World War. CMX2, due to debut in 2006, will feature a new game engine on the same scale as the first; Canadian content is unclear. CM:BO debuted to very good reviews, and was considered a unique approach to the subject matter. Rather than a simple translation of Squad Leader to the computer, the game featured a fully interactive 3-D environment and a simultaneous resolution system where turns played out in real time, with a pause every 60 second to update orders to all units. The units consisted of individual vehicles and guns, sections of men, and smaller groups such as headquarters elements, half-sections and weapon/vehicle crews. Individual snipers were also present. The simultaneous resolution (called "WEGO", as opposed to the conventional "IGO-UGO" ("I go" and "you go", in other words, alternating turns) brought a new sense of realism not often accomplished in conventional hex and counter wargames. The resolution was also unique in that once orders were given, the 60 seconds of game play between turn entries was visual only; the player was powerless to intervene and could not issue orders until after each "movie" or playback. The game was also unique in having significant Canadian content; the first title, CM:BO, focused on combat in North-West Europe and modeled six different nationalities - British, Canadian, Polish, Free French, American and German. Nearly every piece of hardware found in Canadian infantry and armoured units in Normandy and beyond was modeled with accurate detail. The third title, CM:AK, repeated this style of blanket coverage, focusing on North Africa and Italy, and again featured several nationalities, including Australian, British, Canadian, New Zealand, South African, Polish, Free French, American, Italian, and German troops. CM:BO allowed players to command all the major troop types that participated in the fighting on the western front of the European theatre from June 1944 to May 1945. Nationalities included in the game (represented by specific orders of battle, in game graphics, and accurate voice files in their native language) are German, British (English-speaking only), Canadian (English-speaking only), Free French, American and Polish. Canadian soldiers hold the line in Combat Mission: Beyond Overlord. 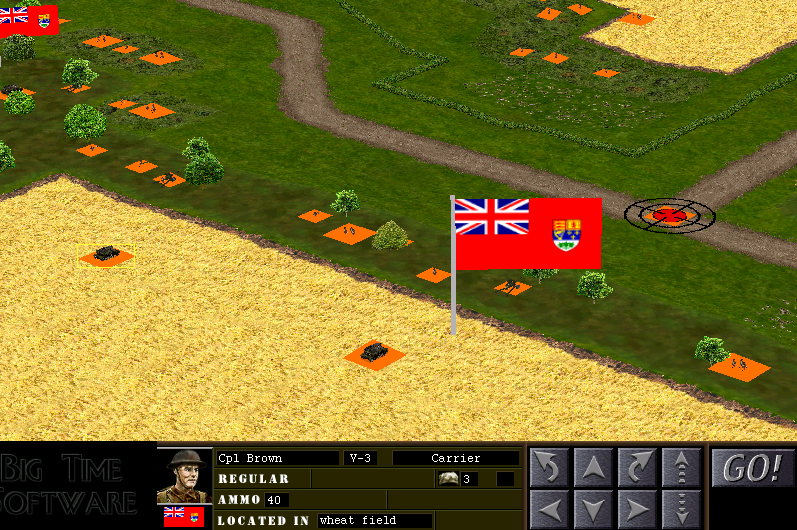 The graphics of the initial game were garish, but small details such as the period correct Canadian flag were matched by other realistic in-game details such as detailed armour penetration modeling. 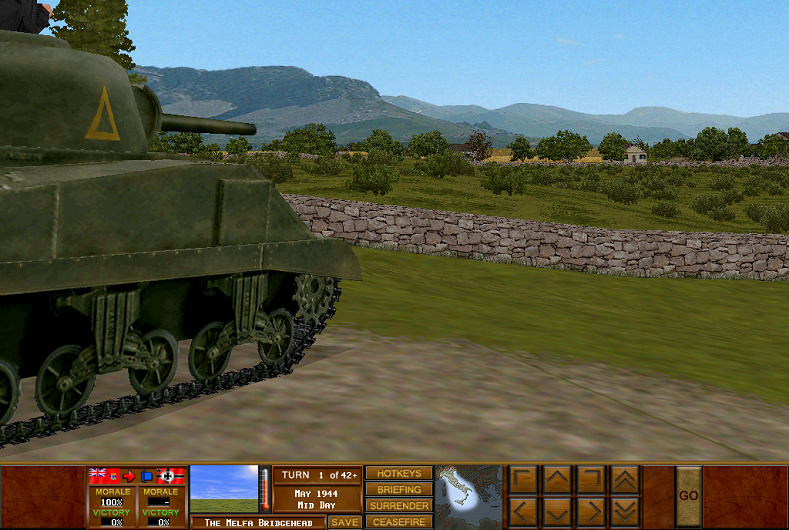 Graphic modifications were easy to implement for CM:BO, and the stock graphics in CM:AK showed marked improvement, as shown above in this screenshot from The Melfa Bridgehead showing a Canadian Sherman tank looking out over the Start Line. As in real life, a wide variety of German armour was available in Combat Mission, and prone to being misidentified as a Tiger or Panther by nervous Allied soldiers. 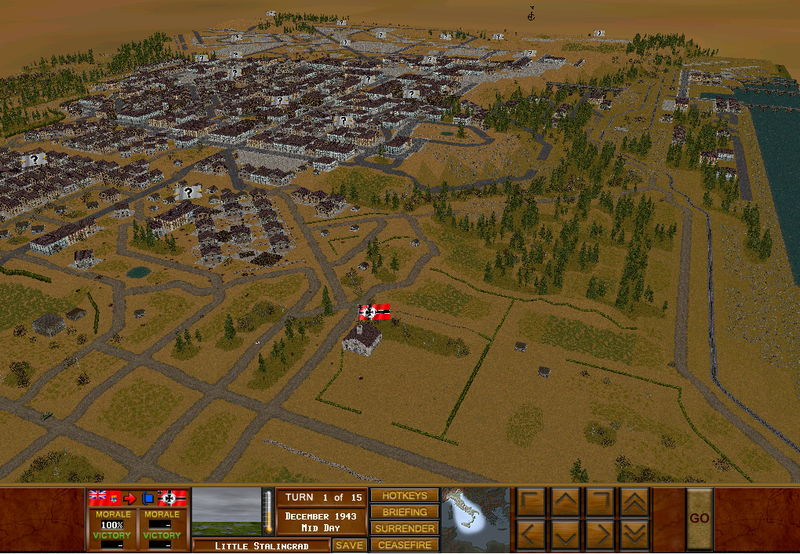 The webmaster designed this Operation - a series of connected scenarios - depicting the fighting in Ortona. Named "Little Stalingrad", the file was released as part of the CM:AK Special Edition disc. CM:BN was released in 2011, the first game using the CMX2 game engine to be set in the Second World War. 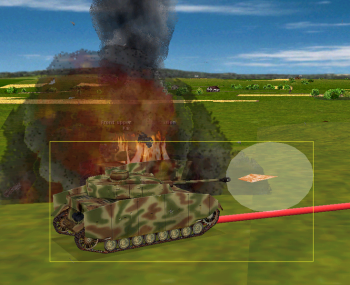 Canadian units are included in the first CM:BN module, entitled Combat Mission: Battle for Normandy - Commonwealth Forces, which was released on March 9, 2012. Canadian paratroopers, slightly modified from the stock artwork, with the addition of golden yellow shoulder loops,Canadian parachute wings, and recoloured trousers. Combat Mission: Fortress Italy also debuted in 2012, set in the Italian theatre. 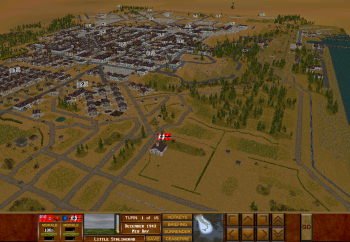 Following the release of the initial game in June 2012, the first module, entitled Combat Mission: Fortress Italy - Gustav Line added Commonwealth forces to the mix, including Canadians. The game covers the period July 1943 to June 1944.